Personally signed by Author Craig Kaintz. 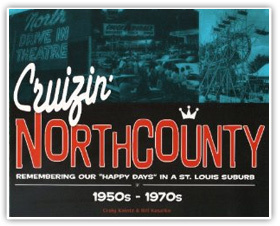 Our Cruzin’ North County Book is a collection of fond memories about growing up in north St. Louis in the 1950s to 1970s. It is the first-ever book to capture the spirit of that time and place. Authors Craig Kaintz and Bill Kasalko have spent years gathering photographs of there favorite hangouts, from the Chain of Rocks amusement park to Chuck-A-Burger, from the diners to the drive-ins, from Bob Kuban to Ike & Tina Turner. “Were our North County homes like Ward’s and Junes’? Not exactly, but our fathers worked, our mothers stayed home and we all had a friend or two like Eddie Haskell. It was new and it was’kool. '” Whether you’re form North County or not, you’ enjoy this pictorial “time machine” of a quintessential American suburb.